In the wake of Hurricane Harvey, the state of Texas and the City of Houston are faced with one of the greatest rebuild challenges the United States has ever seen. 52 inches of rainfall have left over 136,000 residential and commercial structures flooded or destroyed. With billions of dollars in federal aid and what will likely be a decade of rebuilding ahead, there is no better time than now to understand the challenges of disaster relief, how to safely respond, and how we can build in order to mitigate damage from the storms of the future. Identify the environmental factors and features of the built environment that exacerbated the effects of Hurricane Harvey. 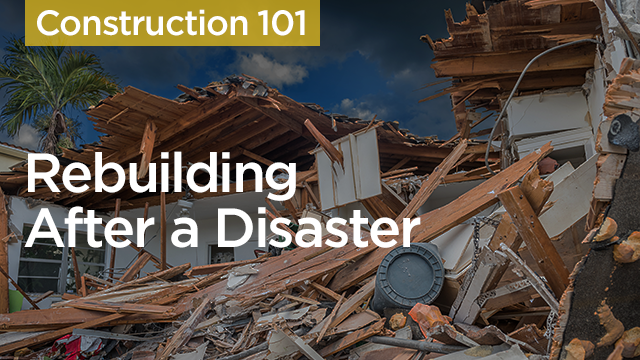 Assess the potential for rebuilding after a disaster given the ongoing construction labor shortage. Understand the safety hazards workers face during disaster cleanup and recovery. Become familiar with building techniques for flood-proofing and damage mitigation in future storms.